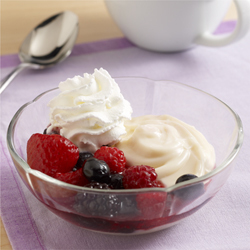 Combine berries and cinnamon in small microwave-safe bowl; cover with microwave-safe plastic wrap. Microwave on HIGH 30 seconds. Stir; microwave 30 seconds more or until berries are thawed and warm. Spoon pudding into serving dishes. Divide berry mixture evenly and place on top of pudding. Top each with one serving (2 tablespoons) Reddi-wip.